ARE YOU TURNING YOUR BACK ON £££'S OF BUSINESS? Have you reviewed your presence on the internet recently? Are you missing out on potential business because you do not have a website or is your current one letting you down? Are you paying too much for your current online solution? Is your website Fully Responsive so that it automatically fits any size screen? Is it in need of updating or redesign so you stand out? Is it EU Cookie Law compliant? 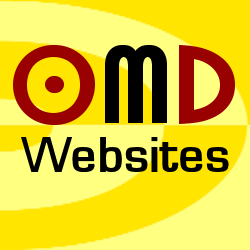 OMD Websites is a national company with local representation and we pride ourselves on the level of service we are able to offer. We provides hundreds of UK companies with their own websites so you can be confident that we are a company you can trust. We offer value for money, effective five page brochure websites that work for just £599 + vat; with design, creation, domain, hosting, search engine optimization and analytics all included in the price. Perhaps five pages are too many for your business. We also offer a single page website for just £299 + vat; ideal for having that all important presence on the World Wide Web! All our websites are Fully Responsive so are design to fit any size screen on any device. We do not use preformed templates but start from a blank canvass on every project designing each website around the clients’ needs, existing marketing materials and logos. Unlike other web design companies we are completely open with the prices we charge for providing your company with an online solution. You can work out for yourself exactly what you will be charged without any pressure from a sales representative and decide before you even make contact with us whether it fits your budget. None of having to fill in a quote request form with the dread of being taken for what the web design company thinks it can get away with....how refreshingly different!! Fully Responsive Design: Automatically adjusts to fit any size screen, on any device, using any operating system, on any browser. Foundation Framework: To ensure our websites are fast, efficient and versatile we code all of them using Foundation Framework, the future standard for building websites. Creation: Once the style has been agreed site creation should not take long assuming all content is available to proceed. We pride ourselves in providing high quality websites quickly; no waiting weeks, or even months, for the end result when you entrust OMD Websites with your website. Domain: Provided with all our websites is a .co.uk domain appropriate to your business or organisation, we even take care of all renewal charges for you. If you already have a domain then it is a simple process to transfer it across to your new website. .com, .net and .biz can also be used but are subject to a small additional charge simply because they cost more to maintain. Hosting: Most website designers charge a monthly fee on top of your initial outlay for hosting a website; rest assured a whole years hosting is included in the price with OMD Websites. Search Engine Optimisation SEO: Getting good results with search engines is often a priority for businesses but beware the website provider who guarantees first page results with all major search engines. No one can guarantee first page results unless you are prepared to enter into a paid for advertising campaign; often costing a small fortune each month. You will want results which are free; referred to as Organic. The only sure-fire way to guarantee a first page result organically is if you search specifically for the company or organisation name but this is only of any use if the person searching already knows of you. True SEO gives results when people search for services you provide in a given area. Although we will not make any guarantees we understand what the major search engines are looking for when it comes to gaining the best results and are usually very successful. Analytics: An understanding of the volume of traffic generated by your website, and how it is getting there, is often of importance to a business or organisation. We routinely monitor websites using Google Analytics, probably one of the most powerful online statistics packages. This can be shared with the client so that they can see the effectiveness of their website and how visitors are interacting with it. Google My Business Page: If you do not have one already we will create a Google My Business page for your business.